Meeting called to order at 8:12 p.m. by pres. Rick. To honor officers who were killed in the line of duty and to honor, respect and remember the lives of the men who fought for our freedom. Read by pres. Treasurer absent. Four prospective new members were presented. Member moved to accept, 2nd, non-opposed and motion carried. Sign in, clean up. Obey rules. Read the application fully. Sponsors get downloads from the website for the applicants. Elliot H. presented his new product to the membership. The lights, asphalt, and ceiling tiles in the works. 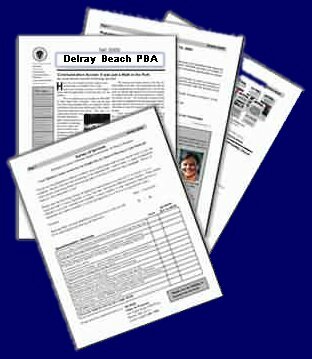 The Delray Beach PBA is a members-only shooting facility located in Delray Beach, FL. This web site is intended to serve its membership as a resource of club news and information.